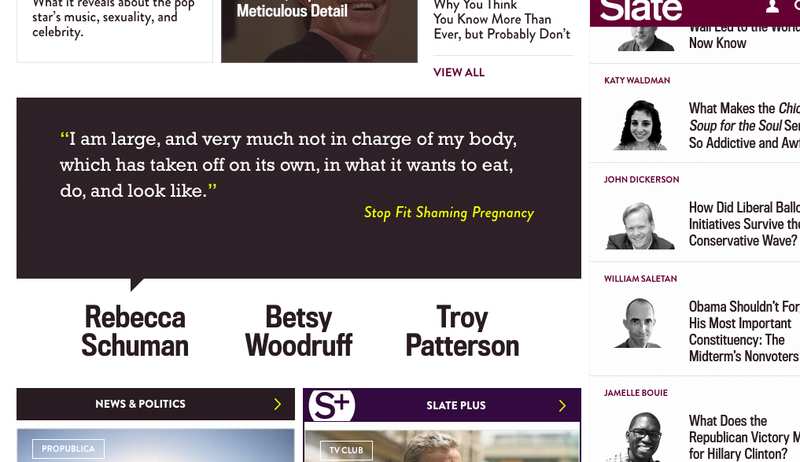 Every once in awhile I make the “pulled quote” promo graphic on Slate–usually it’s for an education thing, but today it’s this. Yeah, yeah, my shadow weighs 42 pounds, etc, etc, etc. I’ve never been pregnant, but I find pregnancy/motherhood politics fascinating, and am also a fan of Zoe Williams at the Guardian, which means that I read a few chunks her book on pregnancy (Bring it On Baby) just for fun, and it seems great and irreverent – its whole message is to forget the guilt. Might be worth taking a look at as an antidote to all those guilty-making Earth Mother books, if you haven’t seen it yet?